THREE PEOPLE HAVE been arrested after a group of protesters occupied Cork City Hall in a demonstration against homelessness. The group occupied the council chamber before midday prompting a number of gardaí to attend the scene. When the demonstrators refused to leave the building on Anglesea Street three of them were arrested and taken to the Bridewell Garda Station in Cork city centre. Gardaí say that no one was injured and no property was damaged during the protest. A spokesperson for the Council said that tonight’s Council meeting will take place as per usual but public access will be restricted. 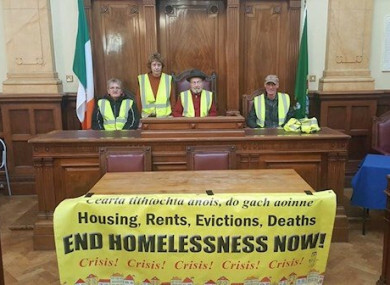 The protesters, who are part of Cork’s Housing Action Group, called on members of Cork City Council to declare that the housing and homelessness situation in Ireland is a national emergency. Council seems more concerned with corporate image and large-scale development projects than with delivering on housing rights. The group plans to hold another demonstration outside City Hall this evening. Email “Three arrested after housing activists occupy Cork City Hall”. Feedback on “Three arrested after housing activists occupy Cork City Hall”.